The next next step historically posed me the most problems. This time proved no different. Rather than plagiarize the steps, just look here for the instructions. To summarize the steps, you must open Eclipse, add the ADT plugin location, and install the ADT plugin within Eclipse. 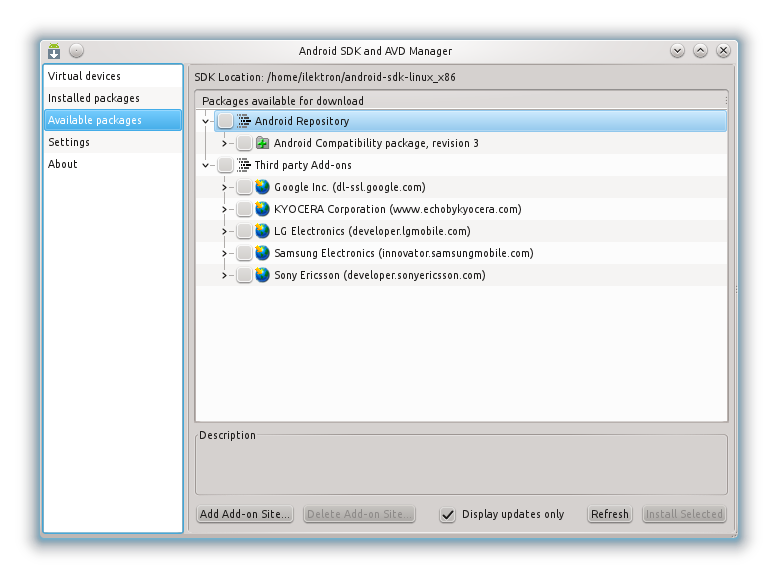 Once installed, you must point Eclipse to the location of the Android SDK folder, previously installed. then try running Eclipse as root. Now, in a terminal, and go to the android-sdk-linux_x86/tools/ directory and run the Android program to open the Android SDK and AVD manager. Select 'Available packages' on the left. Next, select the components that you want. Google provided a list of suggested components here. Once you have selected the packages that you want, click the 'Install selected' button on the bottom right. Depending on what you select, it may need to download several hundred mb. This can take awhile. You can find more information on using the SDK and AVD manager here. replacing (path-to-sdk) with the path to where you installed the sdk. If you followed this tutorial, it will probably be in your home directory. If you've made it this far, before you dive into your 'Hello World' application, you need to create an AVD, or Android Virtual Device. If all went well, you are ready to start developing an app for Android! The official Android SDK instructions say you might have to fiddle with the USB settings to get your physical hardware to play nicely with the debugger. All I had to do was to enable USB Debugging under application settings on the Android device and I was on my way. That was a nice surprise. This time around, installing the SDK went smoothly. I think the SDK and Ubuntu showed some maturity in the ease of installing the SDK. Last year I had to fight a little with things just to get anything to work. Did this work for you? Were you able to install the SDK fine on your machine? What problems did you have? I could not find any e-mail addr to send to, so I hope you get this and perhaps able to help me. I have installed ubuntu 11.10 on a Ora.VBox. I tried to install JDK with the command above but it complained "unable to locate package openjdk". and watch for repo's that fail. Thank you for your guidelines. Really useful one. Enjoying your post. Keep sharing. Get job oriented salesforce training from IT expects. The best part of Android is that you have a number of options with you, and not only some of them..! Wonderful post! Looking forward to learn more from you. Keep us updated.